“Max Ortiz Catalan has developed a new method for the treatment of phantom limb pain (PLP) after an amputation. The method is based on a unique combination of several technologies, and has been initially tested on a patient who has suffered from severe phantom limb pain for 48 years. A case study shows a drastic reduction of pain. Phantom limb pain is currently treated with several different methods. Examples include mirror therapy (see fact box), different types of medication, acupuncture and hypnosis. In many cases, however, nothing helps. This was the case for the patient that Chalmers researcher Max Ortiz Catalan selected for a case study of the new treatment method he has envisaged as a potential solution. The patient lost his arm 48 years ago, and had since that time suffered from phantom pain varying from moderate to unbearable. He was never entirely free of pain. The patient´s pain was drastically reduced after a period of treatment with the new method (see image). He now has periods where he is entirely free of pain, and he is no longer awakened by intense periods of pain at night like he was previously. Modern therapies that use conventional mirrors or virtual reality are based on visual feedback via the opposite arm or leg (see fact box). For this reason, people who have lost both arms or both legs cannot be helped using these methods. -He now experiences that his phantom hand has a position of rest as its normal state. He previously felt like it was a permanently and strongly closed fist. This might be linked to the pain relief since it arose at the same time. -He has learned to control the movements of his phantom hand, even when he is not connected to the treatment system. He has gradually improved in this respect. Now he can go as far as to move each individual finger. -He has restored a perception effect that often arises after amputations – that the phantom hand is perceived as being located directly on the stump – so that he now experiences the phantom hand as being at the anatomically correct location. The technology has advanced a long way since Vilayanur Ramachandran stuck a mirror on the side of a box in the mid 1990s; “We introduce an inexpensive new device-a ‘virtual reality box’-to resurrect the phantom visually to study such inter-sensory effects. A mirror is placed vertically on the table so that the mirror reflection of the patient’s intact hand is `superimposed’ on the felt position of the phantom” (Ramachandran and Rogers-Ramachandran 1996) and the promise of Moore’s Law suggests an exciting future for therapeutic manipulation of body ownership and perception via augmented and/or virtual reality. The promise for bilateral amputees/chronic pain states where “the other bit” (hand/foot/arm/leg etc) can’t be used in a mirror because it’s not there or because it too is part of a pain experience. Would this approach benefit from being part of a graded program? Where might left/right discrimination fit in, if at all? How cool would it be if this technology could be combined with the Oculus Rift? How different is brain (neurotag) activation using this approach as compared to mirror visual feedback. The authors postulate that it is the “promotion of motor execution and the vivid sensation of completion provided by augmented reality” that “may be the reason for the patient improvement”. How does this sit with the graded exposure/graded neurotag activation theory that sits behind GMI? 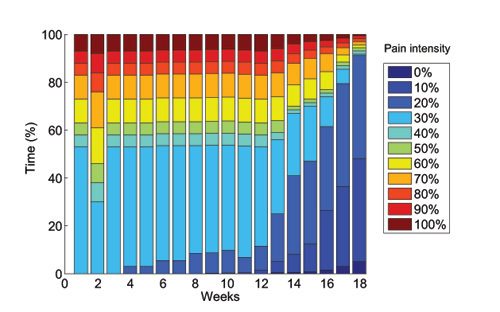 A fascinating change in pain over time; the patient experienced an increase in his pain experience a week in to the trial, it then took about 12 weeks for pain reduction to really kick in but then it really took off. The full text of the paper published in Frontiers in Neuroscience is freely available here.